After 90 years, BMW wants to send a message. 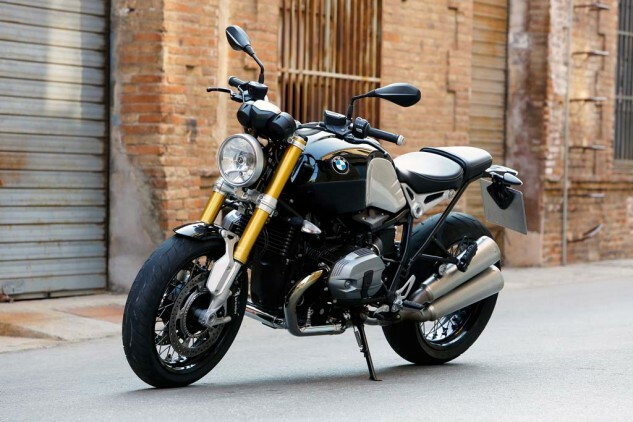 Yes, the company’s representatives and press releases said that the 2014 BMW R nineT is a present for the company, its customers and motorcyclists – which is to be expected. Doing anything for 90 years is admirable, and being, arguably, at the top of your game as you celebrate the anniversary is even better. Still, this is more than a company tooting its own horn. BMW is looking for something and wants to make a point about it. So the company flew us to Munich for our undivided attention. Call it elemental motorcycling: Classic styling and a classic riding position, the nineT takes a state-of-the-art path back to the company’s roots. The process of developing the nineT was frequently referred to as stripping down to the essentials or searching for simplicity or achieving authenticity or creating emotion. This gives a powerful clue of the designers’ intent. In fact, the word “puristic” kept popping up in the live translation the english-speaking press listened to during the entirely German language presentation. After the unveiling we even chuckled about how some terminology just doesn’t transfer between languages and postulated that puristic, which was said about a dozen times, most likely wasn’t even a real word. Well, once again, the native english speakers were wrong about their own language. Puristic is the adjective form of purist, which is defined as “strict observance of or insistence on purity in language, style, etc.” The designers (and, by extension, BMW as a company) are seeking to bring a BMW motorcycle in its most archetypical, elemental form to market. A puristic motorcycle: All the components necessary on a modern motorcycle and nothing else. Don’t mistake this for the design exercise seen so often in the V-Twin world where the bikes are intended to harken back to a lost (and possibly historically revised) ideal past, bikes where the nods to modernity are merely conveniences, like push button starting, or necessities to fulfill current requirements, as in fuel injection used to reduce emissions and improve mileage. Call the nineT a retro bike at this event, and the interviewees wearing a BMW logo bristle, stating that “this is no retro bike.” And they are right. BMW motorcycles have worn classic black often during the company’s 90 years of production. The silky metallic black paint creates an ideal contrast to the clear coated brushed aluminum of the tank. The dawn of the Universal German Motorcycle? The nineT is intended to be a state-of-the-art modern motorcycle, only distilled down to its most elegantly minimalist form without all the laser-focused market segmentation that is the hallmark of current motorcycling. For lack of a better term, let’s call it a universal German motorcycle (UGM), which like the UJM of the era before specialization, is a blank slate for its owner to turn into the kind of motorcycle he or she wants to ride. Now, before the more argumentative among you take issue the implication of a roadster being called a UGM, think of the advances in engine, braking and suspension technology and then consider the performance roots of BMW. A historically cognizant look at BMW’s past makes a strong case for the roadster being BMW’s standard. The style of the UJM was the way it was back in the day because that was the state of the art for a consumer motorcycle. Thankfully, time and technology have marched on to where we find ourselves today. When paring down to the elements of a pure BMW motorcycle, certain design traits must be maintained to stay true to the company’s DNA. First and foremost, the Boxer engine traces its genesis to BMW’s first motorcycle, the 1923 R 32. Look at any Boxer from the front and the lines are unmistakably BMW. Contrary to what we thought when the liquid-cooled Boxer engine was put in the R1200GS, BMW officials say that the air/oil-cooled mill will be sticking around for a while in non-high-performance applications. Since the new liquid-cooled Boxer in the R1200GS has a different front profile (and was designed for a more high performance usage), the decision was made to stick with the more traditional air/oil-cooled 101mm x 73mm 1170cc engine. The DOHC, four valve per cylinder engine is known for its hefty torque and distinctive sound. Delivering 110 hp at 7,750 rpm and 88 lb-ft peak torque at 6,000 rpm, the engine is well suited to provide exciting acceleration. 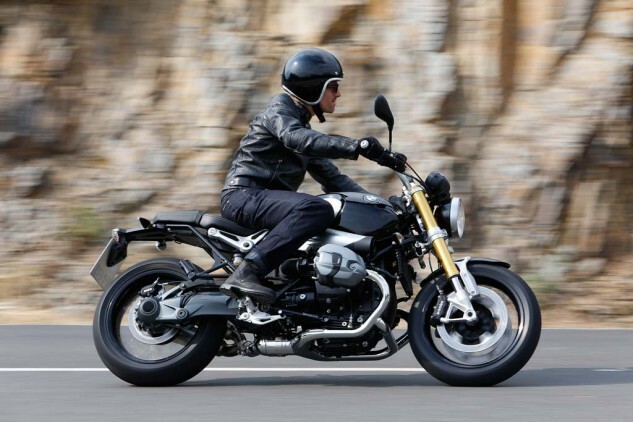 The nineT’s shortened gearing serves to enhance the nineT’s quickness. A study in contrasts: Modern gold fork, retro-styled fender strut, and a classic round headlight with a high-tech reflector. The shape of the gas tank is another distinctive BMW trait that has evolved over the years. The traditional wire-spoke wheels also add to the historical appeal of the nineT while the wheels’ design is a thoroughly modern cast aluminum hub and non-flanged rim. Although these are graced with classic black paint, the 17-inch rims wear modern sport-sized 120/70 ZR-17 front and 180/55 ZR-17 rear tubed rubber. Blending in with the natural color of the stainless steel spokes, the dual 320mm discs add modern technology to classic styled wheels. However, there’s nothing more state of the art than radial-mount, four-piston monoblock calipers and a S1000RR-sourced inverted fork. Fitting a Telelever front end, as is usually done on a Boxer, would have taken away from the classic lines that were desired. The largely two-toned interplay between metal types, textures, and treatments throughout the nineT is one of the bike’s most arresting stylistic features. The in-your-face gold of the fork sits just inches away from forged aluminum brackets that have been glass-bead blasted and anodized a natural metallic color for an almost sand-cast yet shiny look. 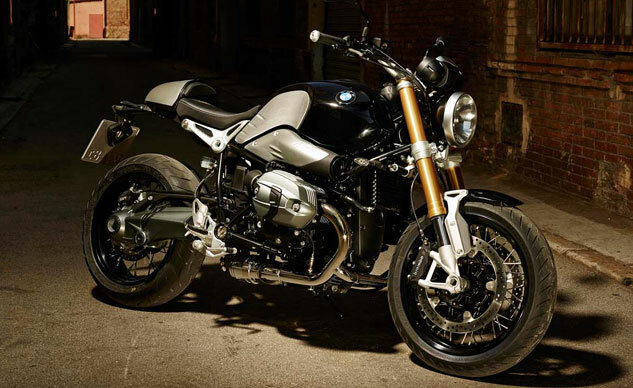 The interplay between the black, gray and natural metal colors make the nineT a standout in the style department. Then there is the juxtaposition between the black metallic of the painted tank and where the scallops for the riders knees are simply a clear coat over the 4.8 gallon tank’s hand brushed aluminum. Glass-beaded, anodized brackets directly behind the seat visually tie the front and the rear of the bike. 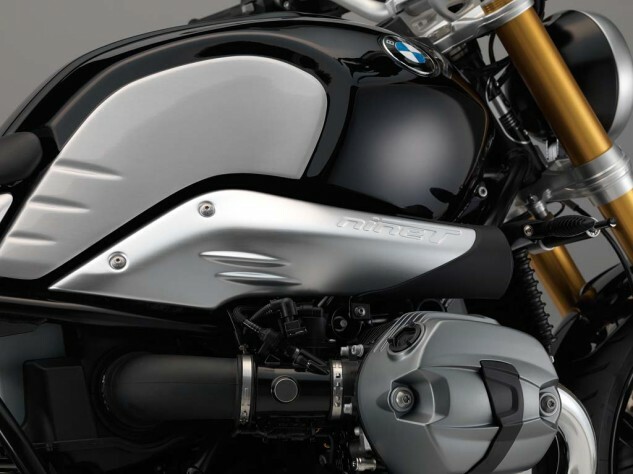 More brushed aluminum – with nineT embossed on the metal – wraps the intake duct on the right side of the bike. While the exhaust headers are chrome, the dual stacked mufflers on the left side of the bike are blasted stainless steel. Under it all, the frame and engine block are anodized black, while the magnesium valve covers and the Paralever contrast slightly with a matt gray metallic color. The stacked dual mufflers on the left side of the nineT can be easily removed to facilitate removal of the rear wheel. 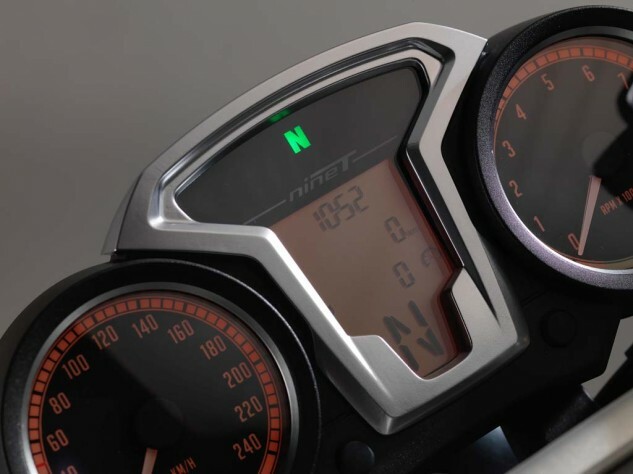 The two-toned theme carries over to the instrument cluster which has traditional, side-by-side, round analog speedometer and tachometer gauges while the center LCD panel is framed in grey. The readout features all the information we’ve come to expect from a modern onboard computer: time, engaged gear, remaining range, trip mileage, servicing interval, average speed and fuel consumption. The dual analog gauges give the important information at a glance. The LCD panel relays information from the onboard computer. When you consider the past, tinkering was a necessary part of just keeping a motorcycle running. Since the market wasn’t so segmented into narrowly focused classes of motorcycles, riders had to alter their machines to make it possible to do the kind of riding they wanted to do. As modern motorcycles have gotten progressively more reliable, the mechanic’s urge remains but needs a new area on which to focus. For many, this urge has switched to customization. Although the nineT was designed with customizing in mind, it looks pretty dang sweet with just an accessory tail cover differentiating it from stock. 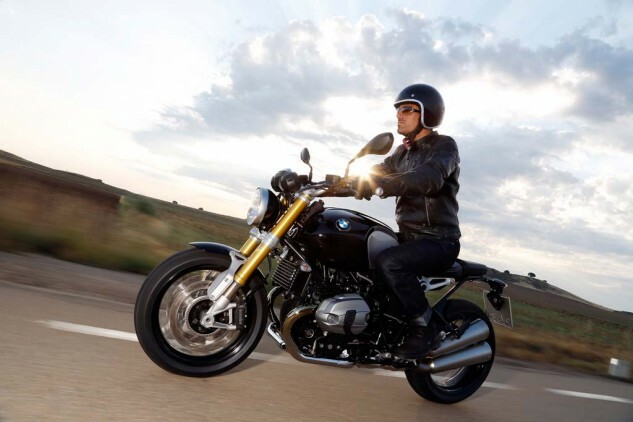 Ironically, BMW’s statements about the ideal customer for the nineT closely parallel those of Yamaha at the introduction of the Bolt earlier this year. Clearly both manufacturers are getting similar results to their customer research – only at opposite ends of the price spectrum. However, when Stephan Schaller, Head of BMW Motorrad, was asked about this similarity in statements, he said that BMW did not have Yamaha in mind but rather Harley-Davidson, with its customer and aftermarket involvement in customization as the influence. This presents a sea change for BMW whose approach has usually been to provide only the accessories that were produced by the factory – ostensibly for “safety” reasons. In addition, BMW executives rarely, if ever, mention any other manufacturers by name, preferring to keep the focus on the superiority of the company’s designs. BMW’s planned customizability is reflected in the multiple exhaust canister and mounting options – all of which allow for the retention of the cable-controlled exhaust power valve. 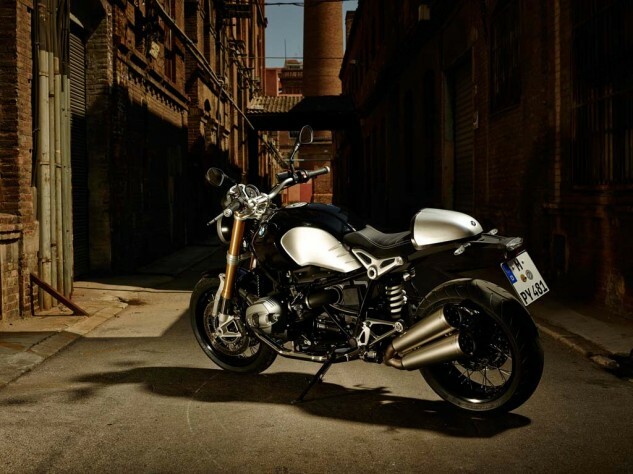 In order to make the nineT a vehicle for customization, the bike was developed with a modular concept that would enable owners to more easily change the bike. The tubular steel frame features sporty geometry of 25.5 degree rake and 4.0 inches of trail on a 58.1 in. wheelbase yet was built with four distinct sections: the front main frame, rear main frame, frame end-piece, and a rear sub-frame. The front section with the steering head bolts directly to the engine and utilizes it as a stressed member. The rear section connects the swingarm pivot to the engine. 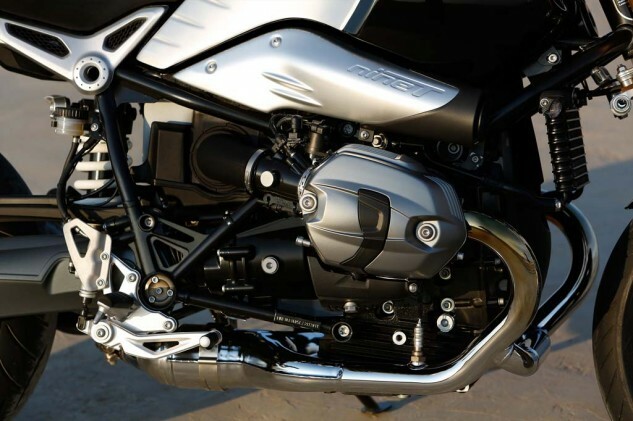 The sub-frame was designed to be easily removable with just eight fasteners, leaving the tail of the bike open for BMW accessories or aftermarket components. The bike comes with a dual seat standard, but pillion can be replaced with an accessory, brushed-aluminum tail cover for a cleaner appearance. For an even more radical, bobber-esque look, remove the entire sub-frame and have the seat floating off the tail of the bike, while the signals and license plate could be attached to the sub-frame mounts. A skilled builder could even fabricate an entirely new sub-frame to achieve whatever look was desired or to alter the 30.9 in. seat height to accommodate rider size. Three versions of the saddle: Standard, solo with brushed aluminum tail cover, and saddle only. You see a stylish naked bike. BMW sees a blank slate for customers and customizers. Similarly, the nineT’s electrical system was created with customizers in mind. The wiring harness has the engine and other wiring separated to decrease the difficulty of major electrical modifications. While this is largely the province of professional builders, the factory also considered the ease of installing aftermarket electrical items like headlights and turn signals. Remember, this is from the same manufacturer that insisted for years that its use of three switches to operate turn signals was superior to the more common single switch approach – despite how riders felt about it. 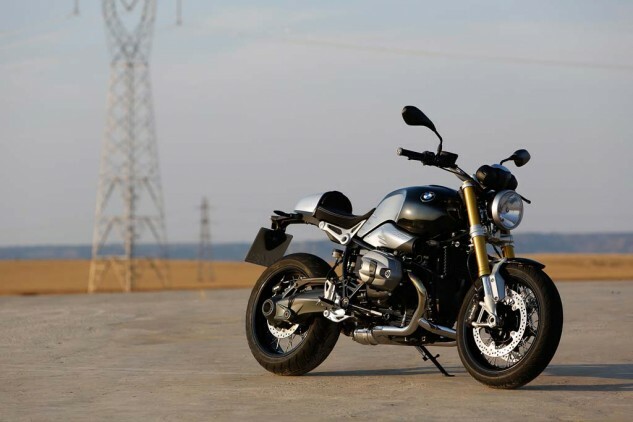 The nineT has traveled a long way since it was first sneak peeked as the Lo Rider Concept in 2008. Earlier this year the Roland Sands Design Concept 90 reignited public interest in BMW’s reimagined roadster. 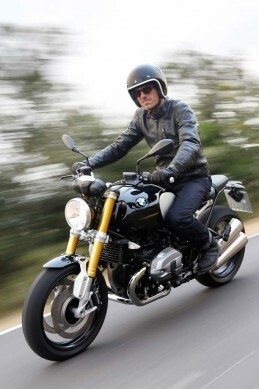 If the reaction of the people present at the nineT’s unveiling in Munich is any gauge, BMW will have a hit on its hands. Neither release date nor price have been set, but its price will surely come in as a premium to the R1200’s $13,880 MSRP. Has BMW created the Universal German Motorcycle? Go see a nineT when they’re available and find out for yourself. 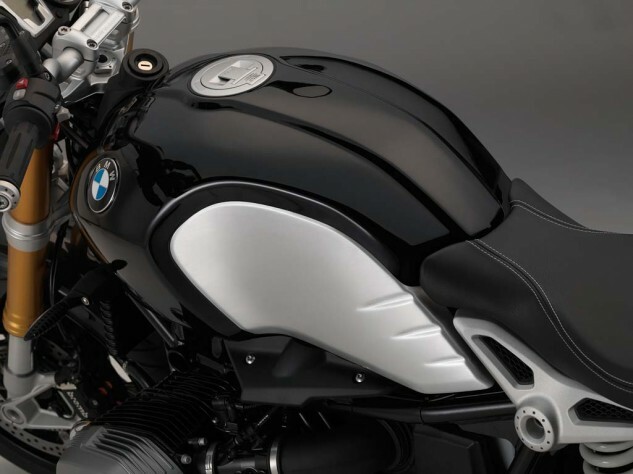 The intake ducting’s brushed aluminum is embossed with nineT and some speed lines that mirror those on the tank. Rake / trail 25.5°/4.0 in.